Carrie Haddad Gallery is pleased to announce their newest exhibit featuring the work of two artists with highly individual 18" minute="0">6 pm to 8 pm, to which all are welcome. In this exhibit, Harry Orlyk’s plein air oil paintings are a selection of winter images from 2010-2011. Snow scenes are a favorite for Orlyk, and the array of colors he uses in these paintings brings to mind the number of names the Inuits have for snow. No doubt, there will be a smell of wet oil paint in the room from works finished just days before the opening. Orlyk’s singular style is forged by combining delicate yet textured brushstrokes. He often used two or three brushes in one hand to accomplish this and to capture the light and shadows before they change. His compositions incorporate all the timeless elements of rural scenes that he paints from the back of his van as he journeys through the verdant hills and farmland surrounding his Salem, New York farmhouse. His work is undeniably indebted to the world he sees around him, and the presence of laborers, trains, bridges, farmhouses and other human elements in his paintings indicate his undying respect for the people that have influenced the landscape he is committing to canvas. Documenting the American farmer is Orlyk’s raison d'être. Tall and lean, Orlyk looks a bit younger than his 64 years, due to his contagious smile and ruddy complexion, a trait that can be chalked up to spending every single day outdoors, despite the weather, in an attempt to document and pay homage to the landscape that surrounds us all. French-born Marion Vinot currently resides in the Hudson Valley, but has lived and worked in Mexico City, Austin, Texas, New York City, and St. Bartholomew, in the French West Indies. 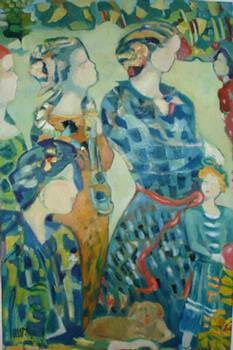 Vinot has gained recognition as an accomplished ceramicist, chef, and painter. Her paintings are, primarily, portraits of women – women strolling, engaged in sports, cooking, napping, or simply pondering life’s possibilities. These portraits are executed in a romantic yet earthy style that brings to mind the paintings of the French Nabis. Vinot works primarily with oils and pastels, and executes her vibrant compositions with warm colors that highlight ornate patterns and textures on the clothes of her subjects. With remarkable skill, Vinot composes a delicate scene of beauty and refinement that transport the viewer from the gallery space into a world where the colors are brighter, the weather is better, and worries are few and far between.